Happy Monday! Well it is a happy Monday for me because I'm not at work. I'm off exploring NYC with Leeann and Christina! I arrived yesterday even and we all met up at our hotel. Blog post to follow when I get back. 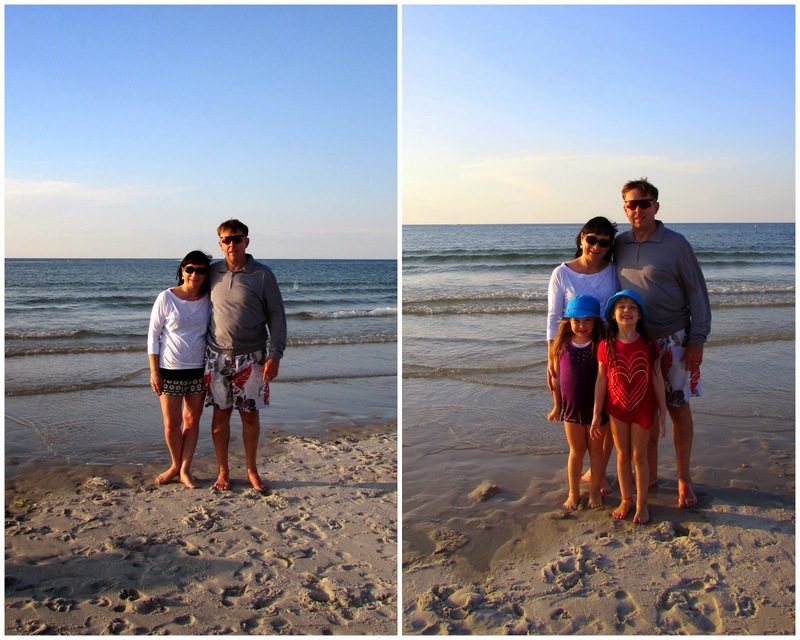 Prior to coming to NYC I got to spend the day on The Cape with my parents and nieces. We had a great day and an especially great evening at Mayflower Beach. Mayflower Beach is in Dennis and it is one of our favorites for many reasons. At low tide it has a huge beach and tide pools, the sand is super soft and clean (no seaweed, shells or rocks), and the sunsets over the ocean are AMAZING! Why do a "normal" photo when you can do a "jumping" photo?! Well we did both! My mom capture all three of us in the air on the first and only try. Pretty amazing especially if you know my track record. We may not have jumped high but let's face it the girls are 5 and 6 so this is great! After a little splashing and jumping around in the water we retired to our chairs and towels for a picnic dinner. My mom had packed all sorts of food for the girls and the adults had Subway subs. It was lovely especially since the seagulls stayed away! We could hardly finish our sandwiches before the girls were begging to get back in the water. . . He's alive! We saw a few!! The girls made sand angels! This is my favorite photo from the whole night! I love the expression on Ella's face - pure joy as Grampy teaches her how to body surf! This is taken from the edge of the water with the sunset at my back. Can you imagine living there? Private beach (in the white roped off area) with a gorgeous view of the sunset over the ocean every night. Can't get much better than that!!!! It was one of the best sunsets we've seen at Mayflower Beach. There were SO many people there. The girls would have stayed in the water all night even though they were shivering. On the way back to the car Peyton said, "Can I go to bed?" If you know Peyton you know she NEVER wants to go to bed so this just showed how exhausted she was from all the fun. If only summer day could be like this one! It was so nice. I only hope there can be a few more days on the beach with my family before the summer is over. P.S. Peyton, Ella and I accepted the #IceBucketChallenge this weekend to #StrikeOutALS. If you missed my post about it go here to see the videos and see which bloggers I challenged! They are so cute together, and their matching hats. So cute. Looks like you had a really great time. The sunset is gorgeous. Have fun in NYC. I wasn't home yesterday to do the ALS ice challenge, so I missed my 24 hours. My best friend's husband was recently diagnosed so I donated directly to his team for the NJ walk in September. I still want to do the challenge to support Jay and Genesis, so when I have someone to film me, I'll get around to it. Love all the pics, the ones at dusk are my faves. Great photos! Hope you guys are having a great day in NYC. 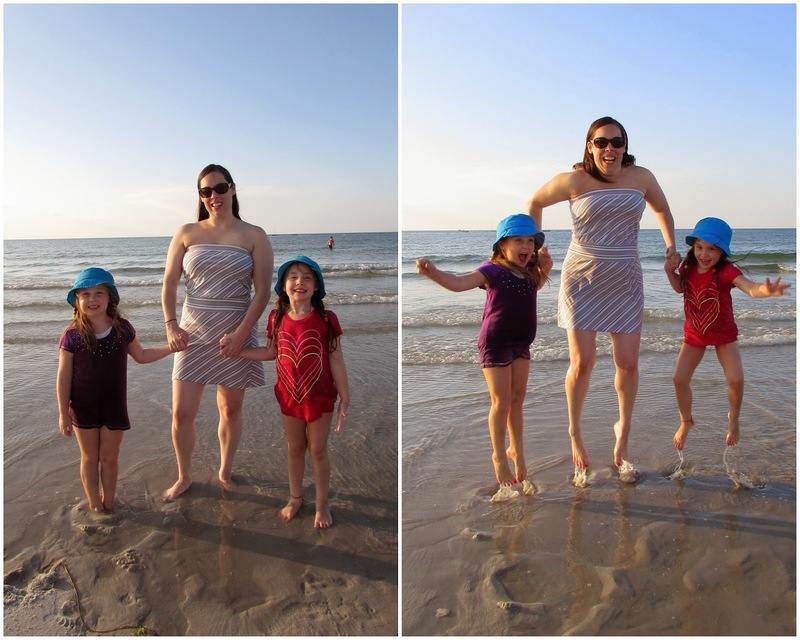 These photos make me want to go to the beach again ASAP...I'm going to try to convince my friends to go this weekend! I love those picturesque beach trails! We only have dunes and grass here. Pretty sunset!! TGIF! 2 Weeks Until MS Challenge Walk!!!! !